The Sustainable Development Goals (SDGs) and the 2030 Agenda for Sustainable Development are at the centre of a global cooperative effort to lift nations and communities out of extreme poverty. The 17 goals, and the accompanying 169 targets, set an ambitious course for sustainable development across the full spectrum of the human and natural environment. 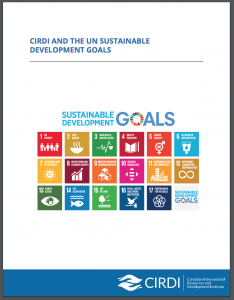 With our developing country partners, CIRDI aims to use sustainable natural resource management and governance as a driver to help achieve the SDGs.